At the WHISKAS® brand we help nurture your cat at every stage of her life with meals she’ll instinctively love. That’s why we use quality ingredients to create delicious recipes that help keep your cat happy and full of vitality. Our delicious Casserole with tender, succulent chunks, cooked to perfection, is so irresistible it will make your cat rush to the bowl! √ No added artificial colours and preservatives. 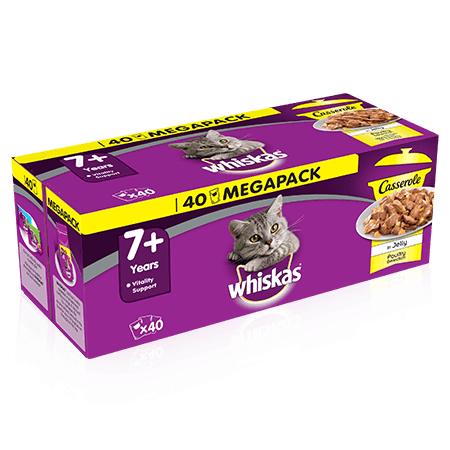 Whiskas 7+ Cat Pouches Casserole Poultry Selection in Jelly 40x85g is rated 1.0 out of 5 by 1. Rated 1 out of 5 by CuriosityKilledThe from What's in it? I'm curious what the ingredients are. For example the "chicken" option contains 4% chicken. What is the other 96%? Meat and animal derivatives (22%, including 4% chicken), vegetable protein extracts, various sugars, minerals. Meat and animal derivatives (22%, including 4% duck), vegetable protein extracts, various sugars, minerals. Meat and animal derivatives (22%, including 4% poultry), vegetable protein extracts, various sugars, minerals. Meat and animal derivatives (22%, including 4% turkey), vegetable protein extracts, various sugars, minerals. Feeding instructions: Allow a transition phase and adjust amounts according to your pet's needs. For overweight cats reduce daily amount. For more information on feeding your cat, please contact our Consumer Careline. Fresh water should always be available. Serve at room temperature, surplus food can be refrigerated for up to 2 days.